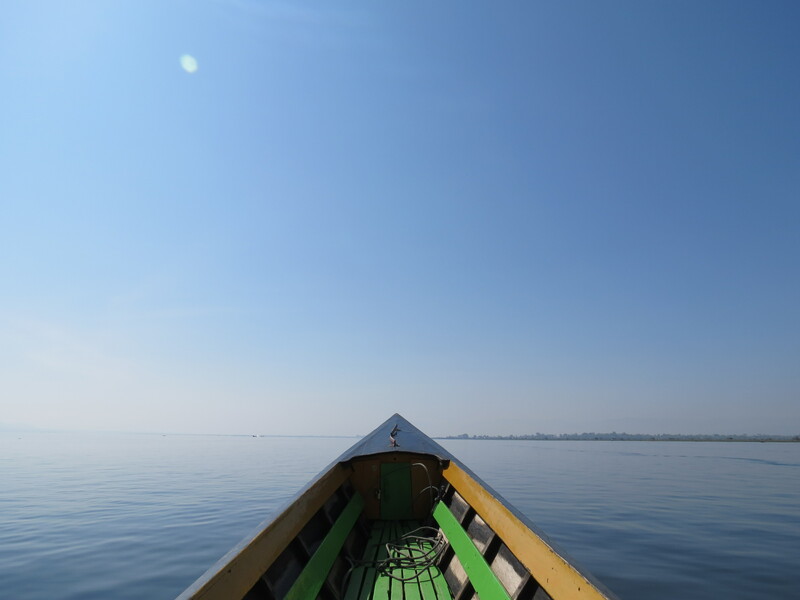 Our trip to Myanmar was only for ten days, so you would have thought that we would have planned exactly what we were doing to do before arriving. Instead we arrived at Yangon airport with a Lonely Planet book we had bought the day before and not yet looked at, no hostel or guesthouse booked, no local money and no idea where we should be headed. We just arrived with our visa and some crisp dollar bills, and hoped for the best. After the ride into town in possibly one of the oldest taxis I have ever seen, I left Katy in a street bar with a fellow traveller while I went to find somewhere to stay. After quite a while of searching around town and finding everything was fully booked, I finally found us a room about 10 meters away from where I left Katy. The room was basic (at best) with a shared bathroom that looked like it hadn’t been cleaned since it was fitted, but we were relieved to find somewhere. When Katy went to pay for her drink, we were told that they didn’t accept dollars, so we had to find somewhere to change money. I was directed to a guy drinking whiskey a few tables back from us. He told me to follow him, and ten minutes later down some dark alley, he welcomed me into his house. Up three flights of stairs and I was suddenly sat in his living room with his whole family watching me. 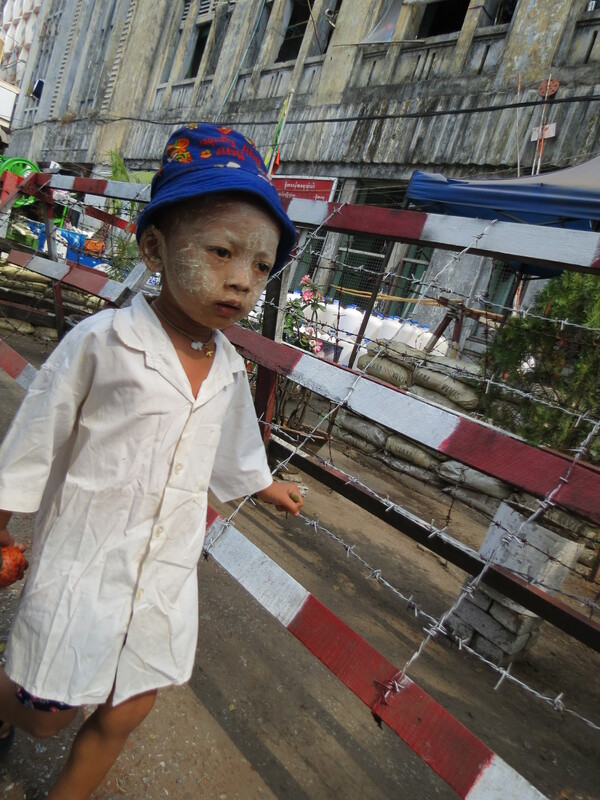 Not long after I was back in the alley with a huge wad of kyat in my pocket. After paying for the drink and dumping the bags in the room, we had a bit of time to walk around the city and take in the sights. It’s a very different place to anywhere we’ve been so far. It’s got a huge Indian and Bangladeshi influence and men in longyi (sarong like skirt) and women and kids wearing thanaka (traditional white make-up) can be seen everywhere. Betel is nuts wrapped in a leaf eaten in a similar way to chewing tobacco, and is also very common. People chewing betel smile at you with their blood-red teeth, before spitting a mouthful of red liquid on the floor in front of you. After some lovely Indian food from a little shack, we headed back to our damp smelly room. We thought it was about time we did some planning. The next morning we got our bus ticket sorted for later that day, and changed some more money. We only had a few hours before we had to leave Yangon, so we went straight to the main attraction, the Shwedagon Pagoda. It’s a pretty impressive place where all locals are supposed to visit at least once in their life. After plenty of photos and Katy getting chatted up by a monk (no really), we headed back into town for some of the famous Nilar biryani. Our next stop was Kalaw, and the bus we had to get had the convenient arrival time of 3am. Its high altitude meant it was freezing cold, but thankfully a guesthouse had sent someone to the bus stop in case somebody hadn’t booked anywhere, which of course we hadn’t. Normally people trek from here to Inle Lake, but we didn’t have time. So we had a relaxing day walking around the old British Civil Servant holiday resort. We spent the evening in a tiny local bar. It looked like we were the first foreigners ever to have walked in there, but they were very welcoming. They gave us some of their bar snacks, which was basically a very tasty ginger salad, and toasted us with some local rum, which of course we were obliged to drink. The next day we got an early two-hour bus to Inle Lake. We only had a day at the lake, so we headed straight out onto a boat trip. 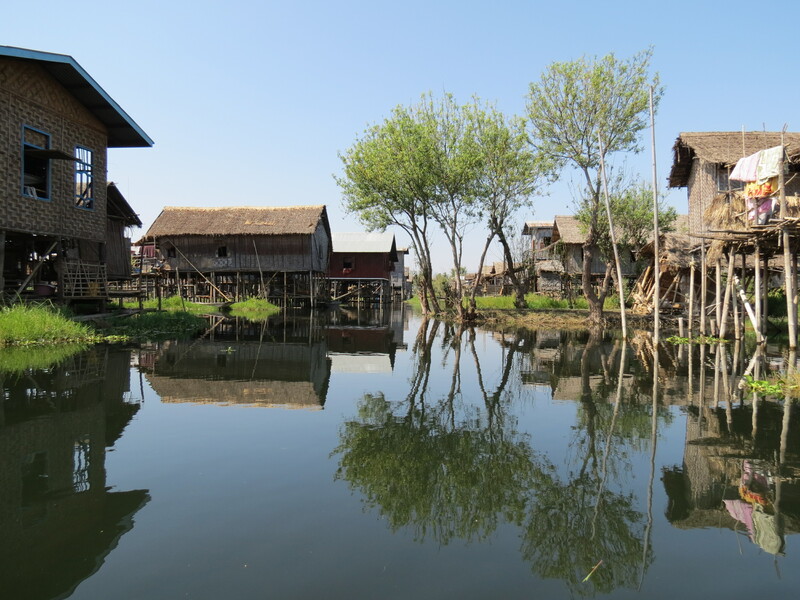 The lake itself is huge and surrounded by stilt-house villages and floating gardens. Various tribes live on the lake and we got to see their communities and how they live off the lake. We were taken around various shops where they basically sell tat to tourists. Anything from silk scarves to bamboo umbrellas could be found, and of course Katy couldn’t resist and paid over the odds for a longyi which she will probably never wear. Katy also got to see a long-neck tribe which she was quite excited about, as we didn’t get to see any on our travels so far. We also saw the local cigars being made. I had previously sampled one that Alex brought me back from Myanmar last year, and they are made with tobacco leaves, star anise, tamarind and banana. We finished the day sunburnt and tired, and had an early night before our 3:30am alarm call the next morning. We had to get a local bus to Nyuang U, and this was probably our worst bus journey of our travels so far. We were the only foreigners on the bus, so we were getting looks from every angle. The seats weren’t big enough for both of us to fit on, so we had to take it in turns to perch on the edge of the seat. There was no air-conditioning and the roads were bumpy and windy. All of this (or at least some of it) was made up for by the stunning scenery out of the window. We started on roads winding their way through mountain villages. This soon changed to palm tree forests and then to almost desert like plains. It made the eight hour uncomfortable journey slightly easier. 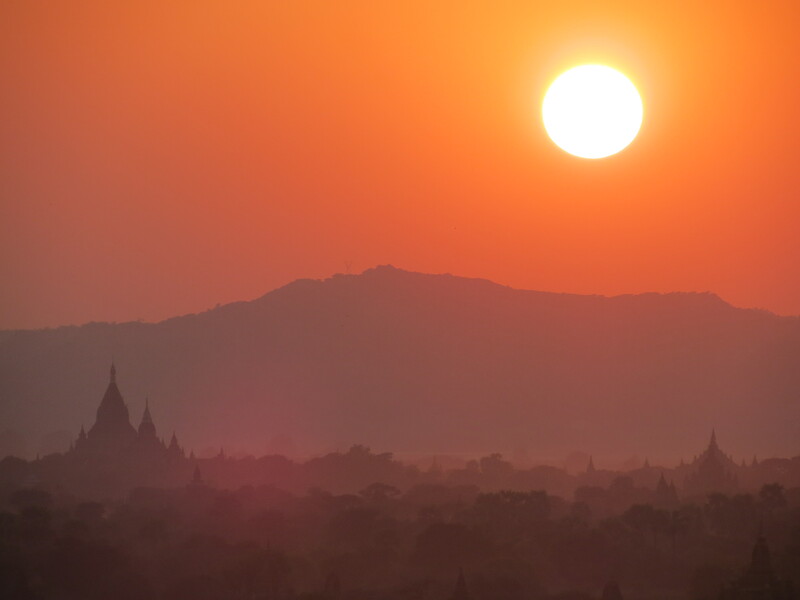 Bagan has over 4000 temples squeezed into a 25 square-mile area, which dates back to the 12th Century. People in the area still get around using a horse and cart, or an ox and cart, but we decided to hire bikes and cycle our way around. It was quite easy to get lost down some of the dirt roads as the map we had was pretty poor; even with Katy’s amazing navigational instincts. We did get to see a lot of temples, although it didn’t feel quite as special as Angkor Wat. It is quite an amazing sight to see all of the temples from a high vantage point. We went to one of the bigger temples for sunset, which had a big terrace viewing platform. It took us a long time to find as this was advertised as the more adventurous option, but it was worth the trip. After all of the effort to get there, Katy wanted to leave before the actual sun had set so we could avoid the crowds and get back to our guesthouse before dark. 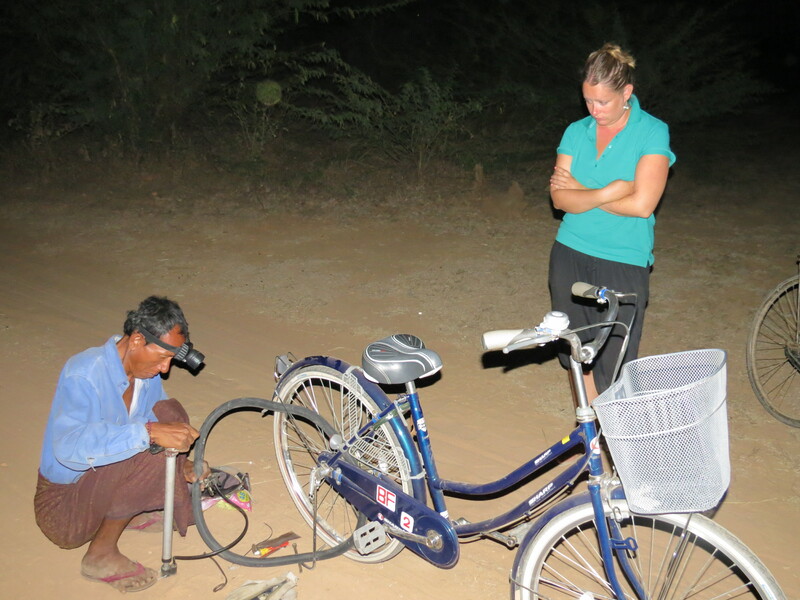 Ten minutes after leaving and taking a wrong turn down a dirt track, Katy got a flat tyre. This does seem to be a running theme with Katy and bikes. So there we were in the middle of nowhere, in the pitch black with no idea of where to go. After Katy stopped crying, out of nowhere (literally) a local man appeared. He spoke no English, but was pointing us in the right direction. Katy showed him that she had a puncture, and the next thing you know he’s run off into the dark. A minute later he returns with a full puncture repair kit and a bowl of water. I gave him our torch, and he was away. It did take him a while, but he did manage to fix it for us. What we would have done had he not turned up is anyone’s guess, so we were very grateful. When we did eventually get back and had showered, it was just in time to watch the Arsenal vs. Blackburn game. I’d found a local tea-house that was showing the game, but instead Katy decided that we should go for dinner. Luckily I didn’t miss a high scoring game (Arsenal 7 – 1 Blackburn), or one of Arsenal’s best performances of the season. To be fair we did catch the last 15 minutes and Henry’s goal. The next day we could barely sit on our bikes as our bums were so sore. So we decided to give the temples a miss and just stay in Nyuang U. We went to visit a factory that makes Pon-Yay-Gyi, which is supposedly Myanmar’s version of Marmite. It was a bit of a random thing to do, and nobody at the place spoke any English. They showed us around, and we think we saw how it was made (out of bean-curd). Most of the people looked at us as if we were mad, but it was quite a funny thing to do. We came out with a little sample, although after tasting it I don’t think I’d want it on my toast. The bus to Mandalay wasn’t the best, and we were relieved to arrive and be shoved in the back of a pick-up truck for our 45 minute ride into town. After booking our bus back down to Yangon and a quick bite to eat, we had an early night. The next day to Katy’s delight we went for a walk around the Mandalay Palace and Fort, which is about 10km of very dull walkways overlooking a moat. We refused to pay the $10 to get into the fort, and hoped that there would be some interesting stuff outside the fort, but there really wasn’t. 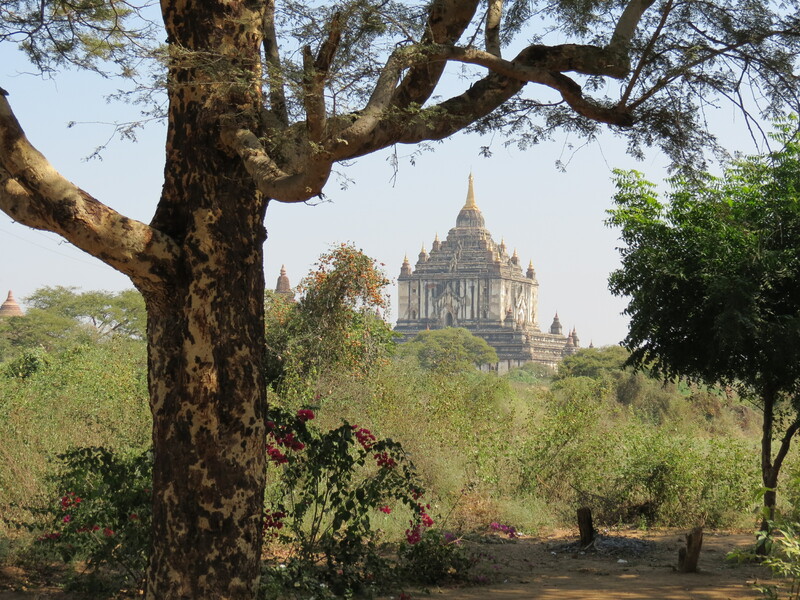 I was quite shocked when Katy suggested that we climb Mandalay Hill for some views over the city. She wasn’t so happy when she was asked to take her shoes off before we started the climb. After quite a few days of walking around temples and pagodas with no shoes on, our feet are in a bit of a state. Katy says that she is in need of a pedicure, but she says that most weeks to be honest. Anyway after about 40 minutes of walking up stairs we got to the peak for some nice views over the city. The locals seemed pleased to see us doing the climb, and most of them said hello and asked where we were from. We found out that last year only 250,000 tourists came here, which is tiny in comparison to it neighbour Thailand who had 14 Million tourists. We decided to end the day with a few beers before dinner, but ended up getting a free dinner thrown in. They gave us peanuts, and every time we finished them they brought some more. Anyway after about ten bowls of nuts, we decided that we didn’t need a big dinner. Instead Katy sent me on the back of a moto to get some samosas. The ride to get there cost four times the price of the samosas, but they were the best in Mandalay apparently. On our last day in Mandalay, Katy decided that we should go shopping. She had seen a shopping centre as we drove into the city, and thought she may be able to pick up some bargains. I wouldn’t really call it a shopping centre. It was more like a bunch of market stalls that smelt of urine under a part built office block. Thankfully we didn’t stay in there too long. 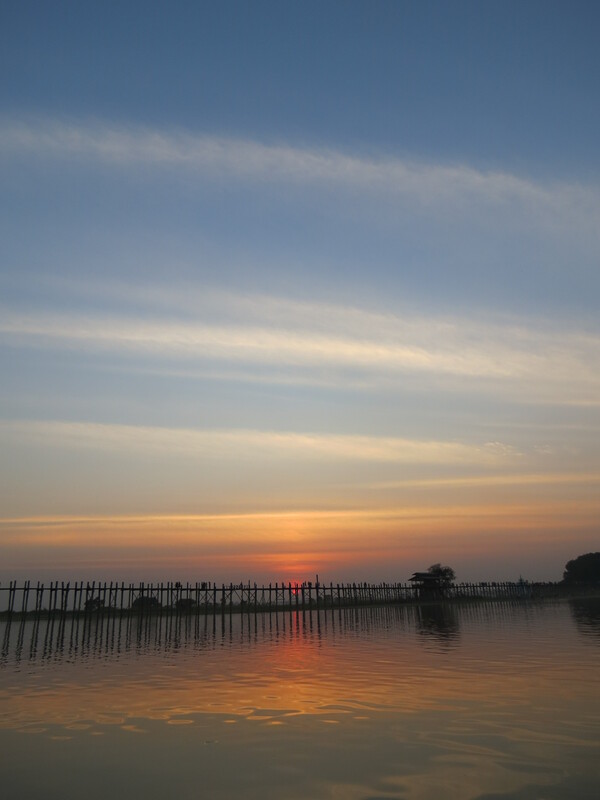 We ended the day at the U Bein Bridge for sunset. 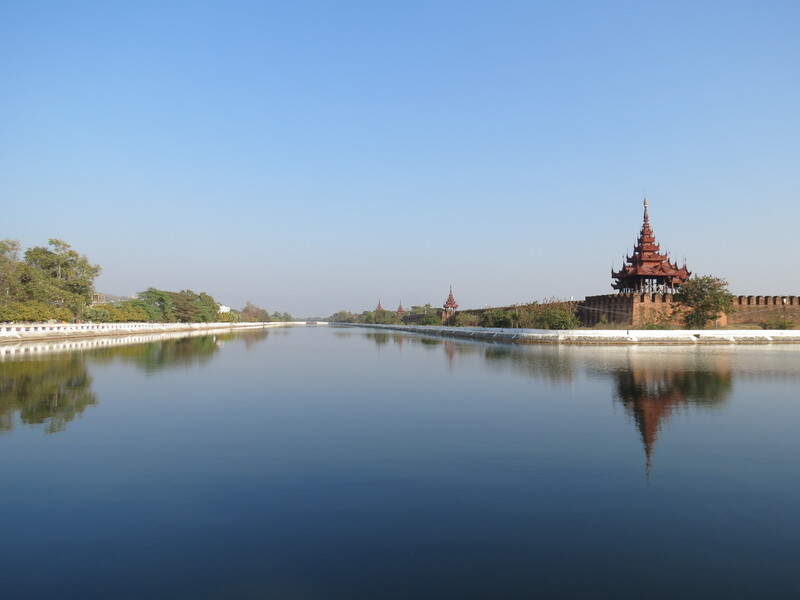 It is the world’s largest teak bridge, and one of the main tourist attractions in Myanmar. It was quite busy, but there were some great views. We walked across one way, and then got a boat back. It was a nice way to end our stay in Myanmar; just a shame that this was followed by an overnight bus journey to Yangon before getting a flight at 08:30 in the morning. We’re currently sat in the airport waiting to board, with only about an hours sleep. Overall Myanmar has been a great place to visit. We have rushed around the country a bit, so we’ve not had much time to relax here. Katy hasn’t enjoyed it as much as I have, but we’re both really glad we came. The people are so friendly here, with most people keen to say hello and practice their English. We’re looking forward to getting back to Thailand now though. We’ve got a busy weekend in Bangkok with Katy’s brother Dave, before heading south for some beach time.